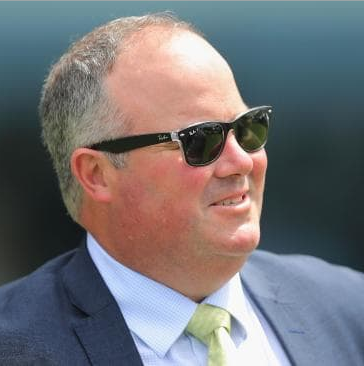 Brothers-in-Law Brad Widdup and Christian Reith have an extra incentive to score with cleverly-named youngster Yalanji at Hawkesbury on Sunday. “Family horse” Yalanji lines up for his third career start in the Schweppes 2YO Maiden Plate (1300m) – and will race in blinkers. Trainer Widdup and jockey Reith married sisters Milissa and Bettina respectively, and all except Reith (jockeys are not allowed to race horses under racing rules) are in a syndicate which races the colt. Widdup has been patient with Yalanji, trialling him on five occasions (placed three times) over a number of preparations before taking him to the races at Kembla Grange on May 12. He made a promising debut, finishing third to Natalia in a 2YO Maiden Plate (1000m), and then tackled midweek company in town when sixth to Silent Explorer in a similar race over 1200m at Warwick Farm on May 30. Yalanji is a son of Mossman (a noted wet track sire), which is also the name of a town in the Far North Queensland hinterland, well known for the Mossman Gorge – a picturesque stretch of tropical rainforest. The Kuku Yalanji people are an indigenous group originating from those rainforest regions. Widdup has praised the introduction of Hawkesbury’s new Polytrack training circuit, which was opened earlier this week. Whilst Yalanji is Widdup’s sole runner, Reith has two other Hawkesbury bookings; Dad’s Boy for also Hawkesbury-based Scott Singleton in the Harriet Nixon Memorial Metro & Provincial Maiden Handicap (1300m) and Art ‘N’ Ollie for Bathurst trainer Dean Mirfin (Polytrack Benchmark 64 Handicap, 1000m). Singleton and Garry White have each trained eight winners on their home track this season. Widdup is next with six. Singleton also starts Lexi’s Choice (Rachel King) in Yalanji’s race, whilst White has two runners; Brown Thomas (Metro & Provincial Maiden) and Military Academy (Benchmark 64 Handicap, 1000m). Andrew Adkins rides Brown Thomas, a Bathurst placegetter on Anzac Day at only his second start, and Tye Angland partners Military Academy, one of a number of excellent bookings he has at the meeting. Military Academy broke through at home on April 17 over 1100m before finishing second to Inquiry there in a Class 2 over the same distance on May 10. The Snitzel three-year-old then ran fourth to Americana Magic in a Wyong Class 1 (1200m) on May 22. White subsequently trialled him at Warwick Farm last Monday where, with Angland aboard, he beat seven rivals in a 797m heat. Military Academy jumped well, sat outside the leader and scored narrowly without being pushed out. Angland has mounts in seven of the eight races. His other rides are Greenspan (Weddings at Hawkesbury Class 1, 1800m), Garry Frazer pair In The Zone (Melrose Access Hire Maiden, 1500m) and first starter Angelo (Can Assist 3YO Maiden, 1000m), Indisputable (Metro & Provincial Maiden, 1300m), Munich (2YO Maiden, 1300m) and Gravitate (Iron Jack Benchmark 72 Handicap, 1300m). Angland, who cut his riding teeth on the Hawkesbury track when apprenticed to Frazer, is currently in third place with 13 wins in this season’s premiership. He has a splendid opportunity to make ground on front-runner Brenton Avdulla (21) and Josh Parr (15), both absentees from the Sunday meeting. Hawkesbury this morning was rated a “Soft 7” with a penetrometer reading of 5.28. A total of 35mm of rain has been recorded in the past week, but nil in the last 24 hours. RACE 1: BRITANNICUS, Princess Mia, Greenspan. RACE 2: THE CARTOONIST, In The Zone, Follow The Money. RACE 3: ANGELO, Elementae, Mandalong Nicko. RACE 4: INDISPUTABLE, Bad Boy For Love, Broom Broom. RACE 5: MUNICH, Yalanji, Writing Unexpected. RACE 6: MILITARY ACADEMY, Rio de Janeiro, Neapolitan. RACE 7: KING TOMLOLA, Hostwin Meraki, Hail The Hero. RACE 8: SLICK SPEED, Wild Horizon, Sir Magic.